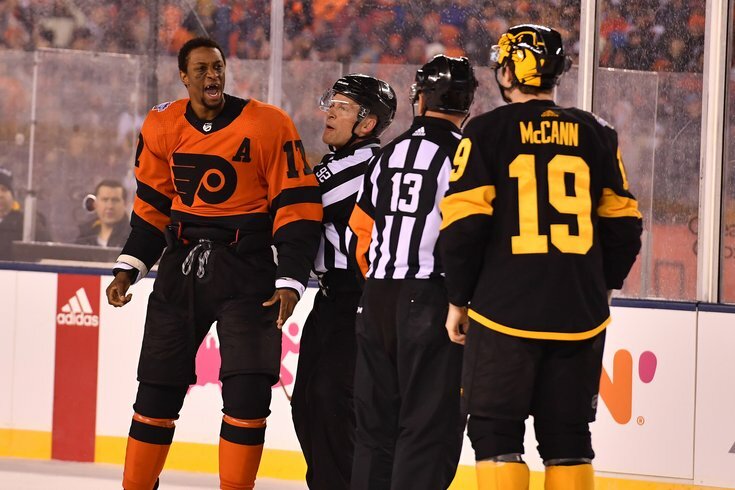 Philadelphia Flyers right wing Wayne Simmonds reacts to Pittsburgh Penguins center Jared McCann during the first period of Saturday's Stadium Series game at Lincoln Financial Field. The Flyers pulled off an improbable comeback win over the Penguins on Saturday night at Lincoln Financial Field, a game that was a microcosm of their entire season. Just when all hope looked lost, and the fans started to give up on the team, suddenly, there was a spark. The Flyers tallied two goals in the final five minutes, including the tying goal with just seconds left to play, and completed the comeback in overtime when Claude Giroux found the back of the net. Now, with the NHL Trade Deadline looming on Monday, the Flyers have a big decision to make. Do they try to make one last playoff push or, currently sitting seven points out with 20 games left to play, do the Flyers go into sell-mode and begin preparing for the 2019-20 season? The biggest name to watch remains veteran forward Wayne Simmonds, who may have played his last game in orange and black on Saturday night. Will that thrilling win over the Penguins be his final act as Flyer? By 3 p.m. tomorrow, we'll know one way or the other.